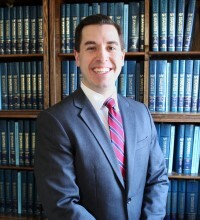 Brian C. Borie joined Little, O’Connor & Borie, P.C., as a principal in 2015, after having worked in another local law firm. Mr. Borie concentrates in estate planning, elder law, trust and estate administration, residential and commercial real estate, business and corporate law, landlord/tenant law, zoning law and general civil litigation. Mr. Borie grew up in West Milford, New Jersey and has lived in the Glens Falls area since 2007. He currently lives in Queensbury with his wife and two children.